The end of the year can feel like an exhausting race from celebration to celebration, and a dizzying mix of personal and work deadlines. And the stress of holiday travel, whatever your preferred mode, is real. For many of us, the holidays are a time of anxiety, depression and other emotional challenges. But there's an easy and fun way to de-stress and protect your mental health. Take some time out to volunteer this holiday season. Volunteering helps manage stress. Research shows that oxytocin (a hormone that regulates social bonding) spikes in some people who regularly volunteer, helping them to better manage stressful events afterwards. Connections count. Volunteering helps you feel connected in a way that social media can’t. Pitching in alongside another volunteer creates a feeling of belonging, and in-person activities can help reduce loneliness. Volunteering freshens your perspective. When you do for others, you focus on something else for a while. I often come away with a new perspective when helping those who need it most, and it can boost my outlook on life. It feels good. An act of kindness can improve confidence, self-esteem and your mood because volunteering reduces feelings of depression. Positive emotions reduce stress and boost our immune systems, too. You feel good later. The benefits of helping others last long after you've finished volunteering, and your memories of volunteering can evoke positive feelings. It’s the giving season – why not give a little bit of yourself? You can volunteer from home, at work, by helping a neighbor or by signing up to serve with others. 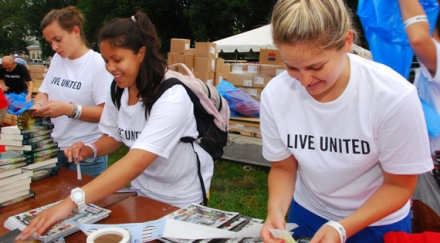 Your local United Way can help you find a volunteer opportunity that works with your schedule. Share the holiday spirit with a de-stressing volunteer activity that makes a difference in your community.